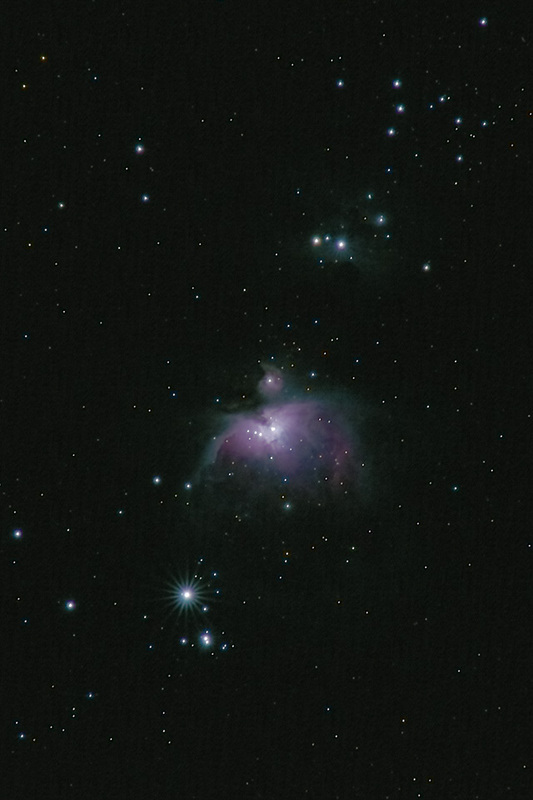 The Sword of Orion with M42 is a favorite and a challenge to image without blowing out the trapezium. This is my first dark sky image with my mirrorless Sony camera paired with a vintage 300mm Nikkor 300mm ED lens. Shooting with an ISO invariant camera at a low ISO preserves dynamic range in this complex scene. The breeze after sunset played havoc with the longer focal length lens, long exposure time, and the small Vixen Polarie mount. Only about half the frames were useable. The result was still good with seven minutes of total exposure. Nikkor 300mm ED lens with a UV/IR cut filter on a Sony a6300 mirrorless camera with a polar aligned Vixen Polarie star tracking mount. Exposures 2 minutes at ISO 400 stopped down to f/5.6 on 2019-04-01 03:26UT. Best 7 images of 14 stacked in Nebulosity. Exposure stretched, sharpened and cropped in Photoshop.